Canterbury District Green Party: Chaucer Fields Update - Please try to help on 11th September! Chaucer Fields Update - Please try to help on 11th September! launch a public enquiry to examine the evidence in more detail. The panel will be informed by a visit to the site (that is, the 40+ acres of the Southern Slopes) at around 11.15 am on that day. There will then be a formal meeting at the Westgate Hall, Canterbury, at 1 pm. It is also a shame that this meeting will take place before term starts, when many students are not here. That’s because students at the University have taken a leading role in supporting the initiative to protect the fields, and that should really be made clear to KCC Councillors. However, some students may be around already, including many postgraduates and those who are based locally all year round from any of Canterbury’s Universities. And in terms of the University of Kent community more broadly, this timing may be workable for many academic, administrative, ancillary and support staff. The commitment and support is certainly there. We know from both electronic and meeting-based polls organised by the University’s main staff trade union, the UCU, that the overwhelming majority of those who have expressed a preference are opposed to the ‘development’ of Chaucer Fields, and support its retention as an unspoilt, shared resource for the whole community. Please make a note in your diaries now, and do try to come along if you can to either or both of these occasions. 2. District Plan – continued relevance of Southern Slopes offer for development? Please continue with the text if you can bear to follow obscure policy twists and turns! First, check out the material at SCF’s website on the Strategic Housing Land Availability Assessment (SHLAA) in their August newsletter, paragraph three; and also review the relevant background documents on that site. Now read on! Until recently, it seems that the potential ‘SHLAA’ status of part of the Southern Slopes was seen as a decision taken in the past, superseded by the proposal to build student accommodation blocks and a hotel on the fields in 2011. Under an apparent veil of secrecy, the University Estates Department had, in 2008, offered 20 acres of Southern Slopes land for development of residential housing in order, according to the 2009 Estates Plan, to ‘release funds’ (a euphemism for making profit by selling of land for ‘development’). But with the Planning Application for a hotel and student accommodation blocks in 2011, this idea seemed to have been shelved. However, it now appears that four years on, the University’s 2008 SHLAA proposal, SHLAA 57, is still in the system, and could potentially feed into the District Plan currently being developed and set for implementation by Canterbury City Council from 2014 onwards. If the University’s offer is still genuinely live, and were to be accepted by the Canterbury City Council, acres of unspoilt landscape, involving trees, hedgerows and fields, overlapping with but extending to an area twice the size of the existing Chaucer Fields 10-acre site, would be lost to the existing community and future generations forever. The map below compares the 2008 SHLAA site (20 acres) with the 2011 site of the Chaucer Fields student accommodation and hotel proposal (10 acres). It also compares those in turn with the 40+ acres of the Village Green Application. 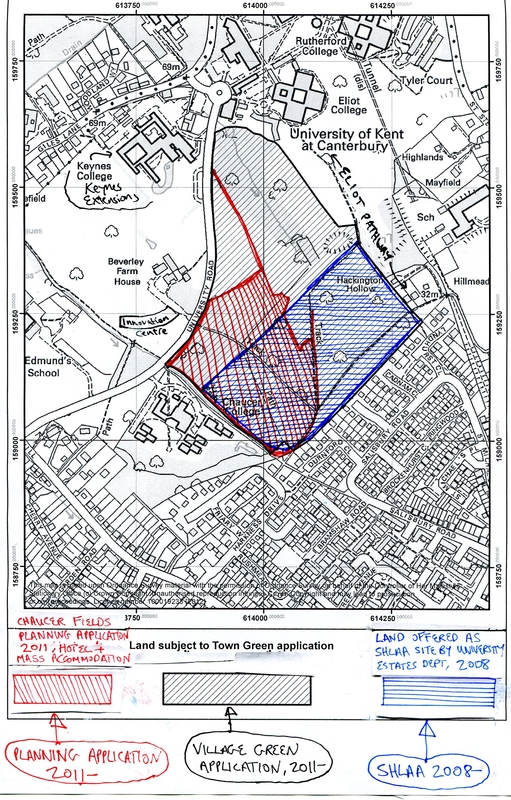 This just goes to show how right the proposers of the Village Green Application were to seek to protect not just the area under threat from the 2011 Planning Application, but also the wider setting of the Southern Slopes! 3. Under a third scenario, whatever the leadership of the University Estates Department is seeking to do is not, in fact, driving the agenda. How so? One possibility might be that Canterbury City Council might be taking the view that the University Estate Department’s manoeuvres are simply irrelevant because of the pending planning application. Or, acting out of conviction, the Council may be proactively and sensibly moving towards consolidating in modern form existing well respected policies inherited from the current District Plan already respecting the value of the fields, especially in the light of contemporary local public and expert opinion. It would then be minded to explicitly dismiss this SHLAA 57 proposal as clearly violating the District’s environmental, heritage and social priorities, and the needs of the community. Of course, those of us who want to see the fields protected and respected for future generations, and trust the Council is on the same page, must hope that scenario three is closest to reality. If not, then of the other scenarios, obviously the first would be infinitely preferable, because it would mean the situation had emerged through inertia rather than manipulative intent. However, we won’t know for certain until we see later this year how the Council chooses to react to the 2008 SHLAA 57 offer originally made by the University. That’s when an early version of the future District Plan will begin to be subjected to consultation. Since this is all so convoluted and uncertain, there’s no obvious parallel to the simple actions available with the Village Green Application, which has been a commendably straightforward and transparent process! But all is not lost. If you are a member of a residents’ association, your association should have been contacted by Canterbury City Council, who are undertaking a very rapid consultation about the proposed SHLAA sites. However, the existence of this process only came to light earlier this month, and the deadline is unfortunately 28th August, a very short time scale given the magnitude of the issues at stake. So it may be your association is struggling to deal with the process, especially at this time of year. Nevertheless, please do contact your association, express your perspective, and ask that it be taken into account in any submission they are making to Canterbury City Council over the next few days concerning SHLAAs – this one (SHLAA 57) or indeed any others that they feel are relevant. If you are not a member of a residents’ association (and most people are not) but a private individual or civil society organisation, you will eventually be able to respond to the version of the new District Plan which emerges at the end of the year. However if you are anxious that this may be too late in the day, and you have time over the next 10 days, you can always write a letter or email the Council’s Local Plan Steering Group to express your reasons for objecting to the development, for housing, of 20 acres of the Southern Slopes. The officer in charge is Adrian Verrall (adrian.verrall@canterbury.gov.uk), but perhaps also copy your correspondence to the generic email address for his team (planningpolicy@canterbury.gov.uk). If you do this, the worst that can happen is that your letter is disregarded as inappropriate (because it is not from a residents’ association), or held back for consideration at a later stage of the District Plan consultation process, presumably November 2012 onwards.